The Certificate in Payroll at SCQF level 6 is a new work-based qualification that provides learners with a qualification that will demonstrate their aptitude in this area. This competence-based qualification will develop the learner's confidence and awareness of the skills that they have acquired, which they can use for employment and/or further study. This qualification covers areas such as employment legislation for payroll, reporting, PAYE, Income Tax, and National Insurance contributions. It also covers determining gross pay, payroll verification and reconciliation, computerised payroll administration, and payroll processing. This qualification is available through employers and training providers. Some further education colleges may also offer it. The Certificate in Payroll at SCQF level 6 is a new course for the financial and payroll sector. This qualification is based on the current version of National Occupational Standards, defined by the Financial and Legal Skills Partnership (FLSP) — the sector skills council for the financial and accounting services sector. Supported by employers and the FLSP, this competence-based qualification may form part of a proposed Modern Apprenticeship framework. The Certificate in Payroll can be offered within a workplace environment allowing learners to demonstrate their achievement of the qualification by collecting evidence naturally through their day-to-day work role. This Certificate in Payroll is suitable for those currently employed in an internal or outsourced payroll function who are looking to enhance, develop or certificate their skills and experience. Entry is at the discretion of the centre. However, it would be beneficial if learners were competent in numeracy, communication and IT at SCQF level 5 or have appropriate work experience. No prior qualifications or knowledge are required to undertake this qualification; however, learners should be employed in a suitable position to allow them to generate the evidence for the qualification. Assessors and verifiers must be able to meet SQA's general requirements for technical/occupational competence as outlined in the Guide to Approval. Assessment of this Certificate will be through a series of theoretical and practical assessments or tasks. Most of the assessment is likely to take place in the learner's place of work. 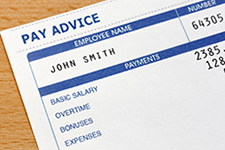 The Certificate in Payroll at SCQF level 6 consists of 11 mandatory Units. Please refer to the Qualification Structure (164 KB) for details on the Units making up this qualification. This Certificate in Payroll at SCQF level 6 is a mandatory component in the Payroll Level 3 Modern Apprenticeship at SCQF Level 6.